Kareen Haim just didn’t fit in with the other teens at her American high school. In her home, Friday nights were for family, not hanging out with friends. She wasn’t much into partying, anyway. As a child, her parents took her to Israel every summer to visit dozens of aunts, uncles and cousins. She wasn’t sure she fit in there, either. But it felt a little more like home. So when her sister was accepted to an Israeli college, Kareen, barely 14 years old, decided she’d go, too. With a little help from Federation, of course. Her first stop? High school, again. Federation partner The Jewish Agency for Israel and its Na'ale program grant Jewish teens from around the world like Kareen full tuition scholarships to attend Israeli schools, and cover room and board and living expenses. The boarding school in Hod Hasharon was a complete culture shock for Kareen. Her language skills needed some work, too. But she she stuck it out—and ended up loving it. “Na’ale made grow up, made me deal with challenges,” Kareen recalls. And as her Hebrew got better, she made fast friends with her Israeli peers. “I am straightforward like them and it fit me more,” she smiles. 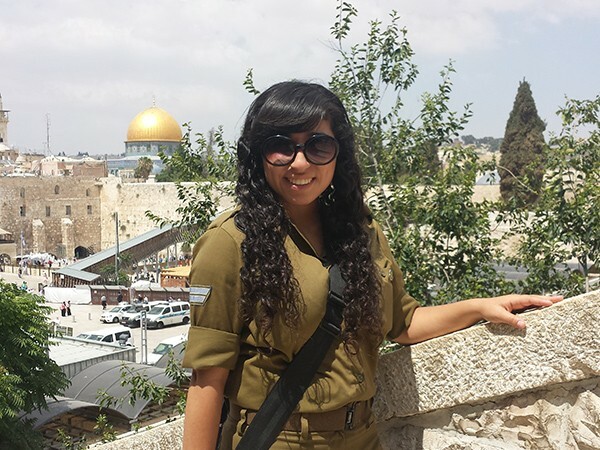 Diploma in hand, Kareen enlisted in the IDF as a Lone Soldier—someone without parents in Israel. Over the next two years, she served in the Air Force, as a police officer at Ben-Gurion Airport and on a military supply chain management base. The jobs were tough, the day-long shifts during Operation Protective Edge harrowing. She felt tired and alone. Again, The Jewish Agency stepped in. Their Wings program helps Lone Soldiers like Kareen develop critical life skills, like managing money, and matches them with personal mentors to help them transition to adult life in Israel. Today, Kareen is living right where her adventure began, in Hod Hasharon. She’s studying criminology and psychology at Ariel University. Though it’s hard being away from her parents, she couldn’t imagine living anywhere else. She plans to stay, start a family there. She’s finally found the place where she fits in—and thanks to The Jewish Agency, it’s home.